This page walks you through the mechanics of locating and using articles from scholarly journals in selected NC LIVE databases. See guides for courses (see all course guides) or subjects (see all subject guides) for more specific recommendations. If you're off campus, you will be prompted to log in when you go to any NC LIVE database.  Use either your JSCC e-mail address or your library barcode number for access. If you don't have either, sign up for a library card. Try a simple search on your topic. Don't worry if you don't get the best results right away – just get an idea of what's available. "jim crow" and "world war ii"
military sexual assault "united states"
Keep in mind that scholarly publications will likely use more formal or technical language, such as "hydraulic fracturing" instead of "fracking." Check the box labeled "Full text" to ensure that all of your results can be read in full. (Some articles are indexed, but do not have the complete article text attached.) If you forget to check the box before you search, don't worry – you can also filter out records without full text on the results page. Are there enough results to start working with? If you got very few, first check your search terms for spelling errors, then consider whether your query might be too specific. For instance, hip hop dance and blood pressure won't get many hits, but you can probably find articles on dance and cardiovascular health. Are most of the results (more or less) related to your topic? If not, did you get several from another field? One of your search terms might be too ambiguous – for instance, "composition" can be synonymous with "writing" in some contexts, but it's got several other meanings in the sciences. Try adding another term for clarification or using the search operator not to weed out recurring unrelated hits. On the other hand, if your search is too vague (e.g., educational systems or women and culture), try to narrow your topic. Seeing only newspaper or magazine articles? Use the sidebar search filters. 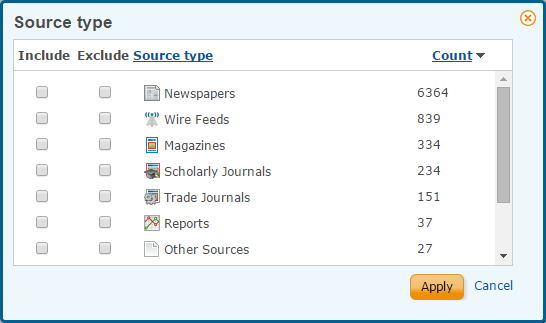 In ProQuest Central, look for "Source type" and select Scholarly Journals. (You may also choose to limit your results to peer-reviewed content.) In Literature Resource Center, choose Literature Criticism under "Content Types," then limit using the options under "Document Type" as needed. When you've got hundreds or thousands of results, don't just dive in! Based on your preliminary search, rewrite your search query (if necessary) to address any problems found in step 2. Use the search operators listed on this page to combine your keywords. 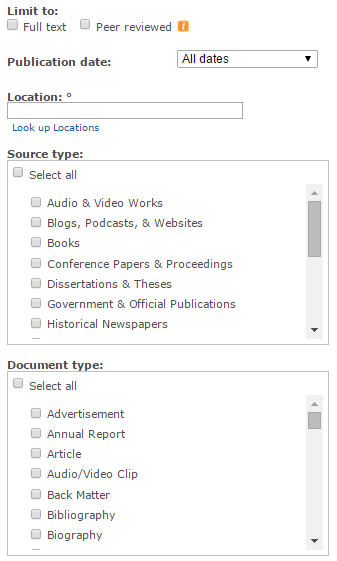 In a general database like ProQuest Central, one of the most useful limiters is source type. 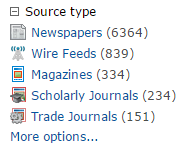 Select (or click on) "Scholarly Journals" to see only results from those publications. Alternatively, you may use "More options…" to choose multiple categories from which you wish to see results. Another valuable limiter is publication date. 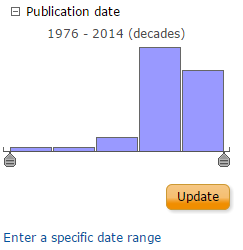 In ProQuest databases, you can use the bar chart and sliders to restrict results (by decade or year, depending on your results) or select "Enter a specific date range" for more control. When entering a date, you can just enter a year (e.g., 2010) unless you know specific dates that are meaningful to your topic. Ending date should be left blank if you want to find everything published since a certain time. You can determine the order in which your results display by changing the Sort option. Typical options are by date – "newest first" (or "date descending") and "oldest first" (or "date ascending") – or by relevance, which means the results that seem to match your search most closely will come first. When you select an article in a ProQuest database, you'll first see an abstract, or summary, of the article. The abstract is not the article. (It may not even have been written by the article's author.) When you're using an outside source in a research paper, instructors expect you to quote or paraphrase from the actual full text of the article. The article may appear below the abstract, with the heading "Full Text." If the abstract is followed instead by the heading "Indexing (details)," you'll need to download the original article as a PDF file using the Full text - PDF link in the sidebar. Even when the article text is below the abstract, it's a good idea to look at the original because (a) there may be transcription or formatting errors in the HTML version and (b) you can find the page numbers you'll need for in-text citations. Most records with full text in Literature Resource Center have citation and indexing information at the top of the page (title, author, publication, source type, etc.) and the article text below. Again, it's recommended that you download the original article, when available, for the formatting and page numbers. Use the Download link in the toolbar at the top of the article. If original full text is available, there will be a radio button marked "PDF" – make sure this is selected, then press "Download" to get the file. Another option is to send any interesting articles you find to your e-mail account. Database records include a built-in E-mail link, which allows you to choose what you wish to send and input any address to receive the article. If you prefer a hard-copy, you should either print the PDF or use the built-in Print link, which will remove any web formatting and prepare a print-friendly version of the article. Article databases offer machine-generated citations in common styles (e.g., MLA, APA, Chicago). These may contain errors – you use them at your own risk. If you decide to copy and paste a citation from a database, make sure to proofread it, checking especially for issues like the order of an author's names, capitalization, and italicization.